A mini split system is an air conditioner that does not require duct-work to deliver conditioned air. It is sometimes referred to as ductless systems.It has two separate components: A indoor fan unit, and an outdoor compressor unit. The two units are connected by a line-set that contains the electrical wiring, refrigerant lines, and condensate tubing. The indoor unit is mounted in the room that needs conditioning and it may be installed on the ceiling, wall, and even the floor. This depends on both your needs, home design, as well as visual appeal. The outdoor unit can be placed anywhere outside of the home provided it is within 50 feet of the indoor units. The outdoor unit can be mounted on a concrete pad or bracket on the wall. The central air system works very similar to a ductless system with one key difference. In a central system, there is only one evaporator whereas a ductless system can have multiple evaporators. Each indoor unit has its own evaporator. This means you can include up to eight indoors units. Why a mini/single split or a multi split system versus a central ac? There are several reasons why: If a homeowner purchases an older home which does not have duct work already. They cannot install a central unit without installing duct work in their attic, basement, and other rooms. This is a very expensive option as this type of work requires consulting professional engineers to re-design and approve drawings on top of the cost to supply and install the central AC. A more attractive and cost effective option is to install a ductless solution. This is especially true for Toronto and the GTA where there are many older homes currently being being heated with electricity or boiler systems without ducts. One of the most attractive reasons for ductless systems is the energy savings. The problem with central AC’s and conditioning through ducts is that there are always leaks which causes conditioned air leaking into non-wanted areas such as attics and crawlspace. Leaks work both ways meaning hot air could leak into a duct delivering cool air thus not delivering cool enough air to your house. Why are SINGLE AND multi-split systems the ultimate in zoning? 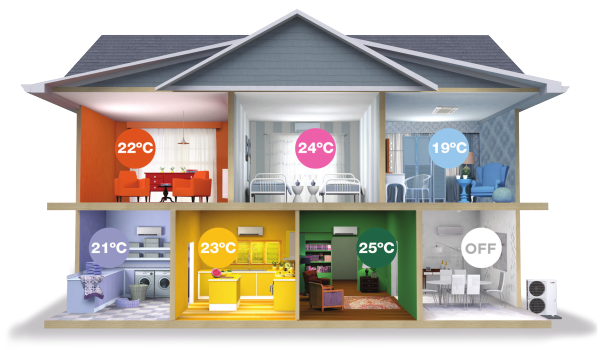 Zoning means different temperatures are maintained in different places dependent on your need. For example, in the summer, if you have zoning air conditioning you can reduce the amount of cool air delivered to your bedroom during the daytime when not needed and deliver more cool air to the kitchen and family room that is currently being occupied. You can then reverse this in the evening when you require cooling in your bedroom. Ductless systems provide the same comfort because each unit in each room has an evaporator and each room temperature can be controlled separately. Are ductless homes just for older homes? what other applications are there? Besides older homes without duct-work. Ductless systems are ideal for renovations and remodeling where extensions or additions to your home is added. It can be costly or unwanted to add ducts so ductless is perfect. Ductless systems are also ideal for basements, garages, small businesses, server rooms, and even a “mancave”. What is a ductless unit with Variable Refrigerant Flow? Variable Refrigerant Flow means that the system is able to control the amount of refrigerant entering each indoor unit. The most popular technology behind this is called Inverter. This technology allows the system to adjust the capacity according to the changes in the air conditioning load and the differences between the indoor temperature and the set temperature. Without Inverter technology, the capacity is constant and the temperature is controlled by stopping and starting the compressor repeatedly.